This 6" Round Basin comes in your choice of 1 outlet or 2 outlets. This round catch basin is manufactured from High Impact Polystyrene (HIPS). It is used to collect and disperse excess water to prevent potential damage to landscapes and property. 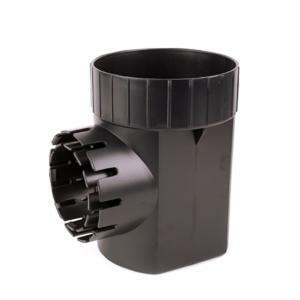 This basin can be used with 3" & 4" Sewer & Drain Pipe, 3" & 4" Corrugated Pipe and 3" & 4" Triple Wall Pipe. This basin is designed to accept the 6" Round Flat, 6" Round Atrium and 7" Square Universal grates. Catch Basin includes a sump, which allows sediment to settle in the basin to reduce clogging of pipes.